Fish that eat plants and algae? Many of the utility fish used in the maintenance of Phoenix man made lakes are plant eaters which serve as a natural, biological control for aquatic plants in the lakes. The most common fish employed for the task of controlling plant growth are Israeli carp, White amur, and tilapia. Some of the more aggressive plant eaters are White amur or grass carp which are native to eastern Asia and were introduced in 1963 in the United States to control aquatic plants. They can consume up to 3 times their body weight daily and live on average 5 – 9 years. Tilapia is another useful plant eater that reproduces quickly, likes warm and is at risk in cold water. When the water temperature drops below 55 degrees, they are in danger. After a couple of days of very cold weather, any dead fish in the lake is most likely a tilapia. Some people have asked me about mosquitos especially around lake water. This is unlikely in Phoenix waterfront properties since mosquitos breed best in shallow, stagnant water with cover. Nearly all of the banks on Phoenix man made lakes have a cement bank that drops off very abruptly. 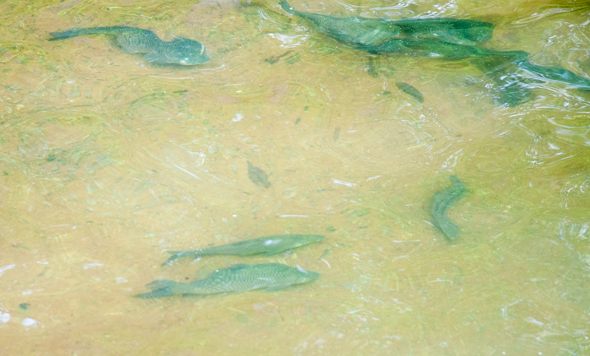 If this is an issue, the Gambusia, a genus of fish can be introduced into ponds to eat mosquito larvae. Midge flies can be controlled by goldfish, sunfish, or small Israeli carp. Some man made lakes stock fish that are considered more of a game fish. The degree to which lakes are stocked with game fish is a decision that must be made by each community HOA. Some HOA’s consider stocking games fish to be very important, such as The Lakes in Tempe. Other communities don’t consider it a priority. In considering a waterfront property in a Phoenix area lake community, it would be wise to call the HOA and speak to someone to understand their priority on stocking game fish. Typical game fish found in Phoenix man made lakes are catfish, bass, sunfish and in some cases crappie. Another question to ask the HOA would be whether the fishing is catch and take or catch and release. In some lake communities, fish may not be permitted. If the lake water is reclaimed water, then only catch and release is permitted. Stocking fish in any lake is dependent on the time of year. It must be done between the end of October through April since transporting the fish during the hotter times of the year puts them at risk. Another fishing alternative is taking advantage of the Arizona Urban Fishing Program which is considered one of the best in the country. 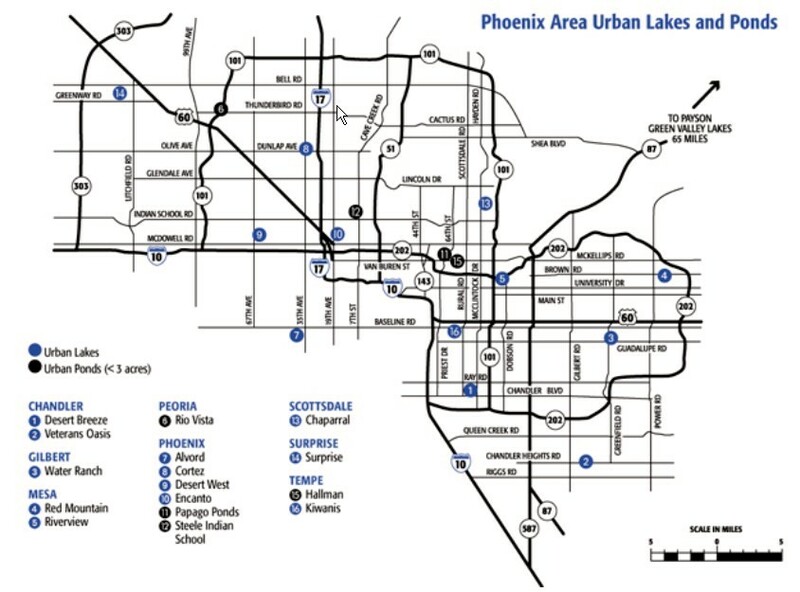 Click on the picture to the left to see the 21 urban lake locations throughout 11 cities in the Phoenix area which are stocked 20 – 24 times per year with trout, catfish and sunfish. This program provides a convenient opportunity to fish for healthy edible fish. As you look at Phoenix waterfront property, talking to the HOA or the company that maintains the lake could be a very beneficial call to understand how the lake is maintained, which fish are stocked in the lake; both utility and game fish, and if it is catch and release or catch and take. They’ll also be surprised that you’ve called, because they rarely receive calls asking for such detail. And while you have them on the phone, ask them for the water source of the lake. That will really put them to the test! If you are a waterfront property owner and would like to know the value of your home, click on What’s the Value of My Home. 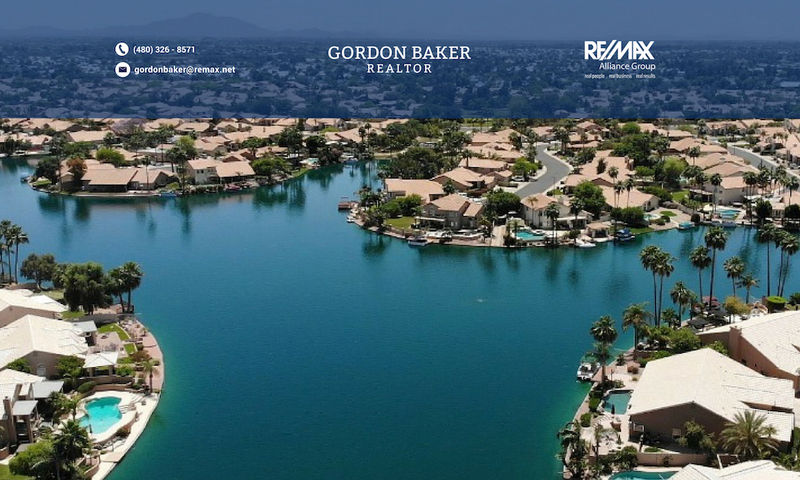 Or for if your dream is to own a Phoenix area waterfront home, click on send me waterfront homes. If you have any questions regarding waterfront homes, please don’t hesitate to call or e-mail me. Many thanks go out to Rick Amalfi of Aquatic Consulting. He is a great source of information since maintaining lakes in lake communities is what he does. As you can see maintaining the lakes in Phoenix urban lakes involves planning and preparation to create its own ecosystem that allows Phoenix to have waterfront property. Where does the water come from for Phoenix man made lakes? Is Fannie Mae over-pricing their foreclosures?